The motto of Mallard Construction says it all … “because Oklahoma weather happens.” And, as everyone knows, that weather can include strong winds and hail a good portion of the year. That’s the number one reason that Concert Golf Partners went searching for a new designer roof for their clubhouse right after they acquired Gaillardia Golf and Country Club in Oklahoma City earlier this year. “The new owners wanted 600 squares of a Class 4 impact-resistant roof system to replace the concrete tiles on their 15-year old country club,” says Andy Lacks, vice president of commercial roofing with Mallard Construction out of Oklahoma City, Okla. “Concert Golf Partners expressed an interest to us in finding a durable lightweight roofing system that would fit the high-end neighborhood surrounding the Gaillardia Country Club while withstanding severe weather. 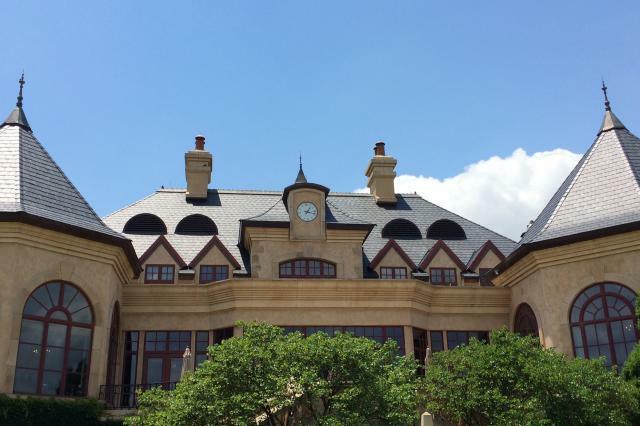 The elegant 55,000-square foot, three-level clubhouse at Gaillardia Country Club has a French Normandy design style and features state-of-the-art meeting rooms, a fitness center, a wine room and an extensive learning center. Interested in how DaVinci sustainable roofing looks on other commercial projects? Then visit Commercial Projects Rely on Polymer Roofing – Part I.